Located in Colonial Zone, this luxury hotel is 0.1 mi (0.1 km) from Calle Las Damas and 1.7 mi (2.8 km) from Embassy of the United States Dominican Republic. 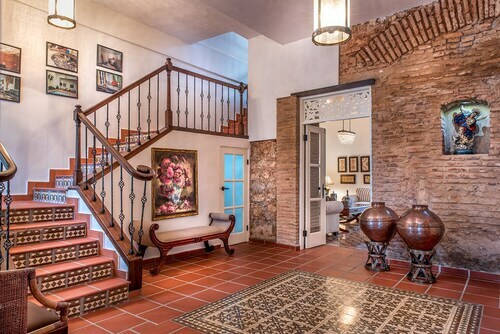 House of Bastidas (Casa de Bastidas) and Trampolin Children's Museum are also within 5 minutes. Located in Colonial Zone, this hotel is 0.1 mi (0.1 km) from Calle Las Damas and 1.5 mi (2.4 km) from Embassy of the United States Dominican Republic. Amber Museum and Parque Colon are also within 5 minutes. 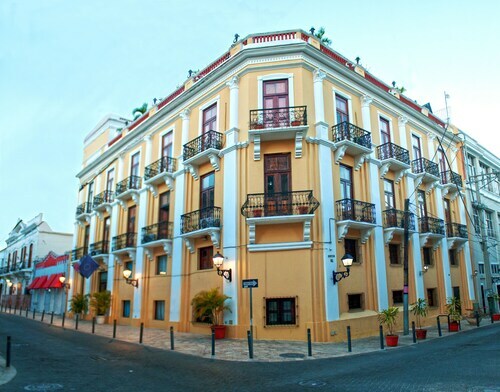 Located in Colonial Zone, this hotel is 0.1 mi (0.1 km) from Calle Las Damas and 1.5 mi (2.5 km) from Embassy of the United States Dominican Republic. Amber Museum and Parque Colon are also within 5 minutes. 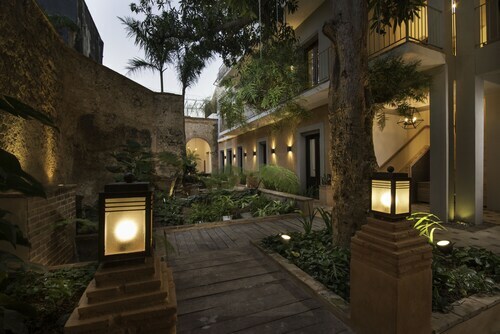 Located in Colonial Zone, this hotel is steps from Parque Colon and Cathedral of Santo Domingo. Embassy of the United States Dominican Republic and Sambil Santo Domingo are also within 3 mi (5 km). 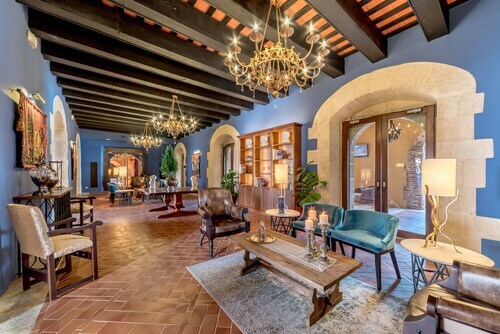 Located in Colonial Zone, this luxury hotel is 0.1 mi (0.2 km) from Calle Las Damas and 1.4 mi (2.3 km) from Embassy of the United States Dominican Republic. Convento de los Dominicos and House of Tostado (La Casa de Tostado) are also within 5 minutes. 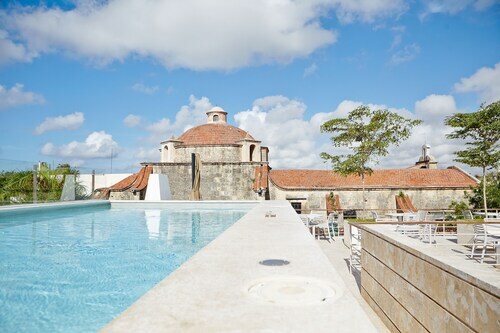 This family-friendly Santo Domingo hotel is located in the historical district, steps from Calle Las Damas, The Cord House (Casa de Cordon), and Cathedral Primada de America. Embassy of the United States Dominican Republic is 1.6 mi (2.6 km) away. 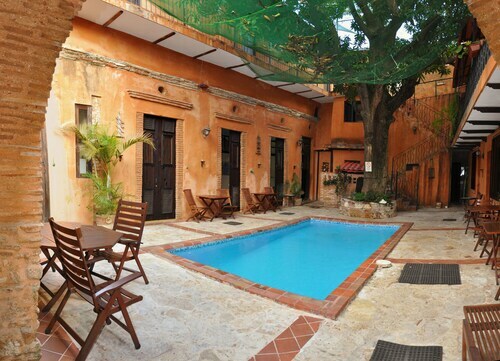 Located in Colonial Zone, this bed & breakfast is 0.1 mi (0.1 km) from Calle Las Damas and 1.7 mi (2.7 km) from Embassy of the United States Dominican Republic. House of Tostado (La Casa de Tostado) and Larimar Museum are also within 5 minutes. 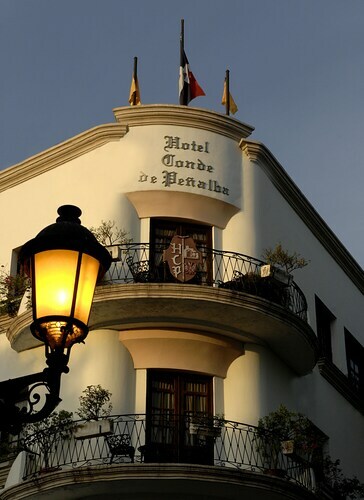 Located in Colonial Zone, this hotel is 0.1 mi (0.1 km) from Calle Las Damas and 1.4 mi (2.2 km) from Embassy of the United States Dominican Republic. Mercado Modelo and National Pantheon (Pantheon Nacional) are also within 10 minutes. 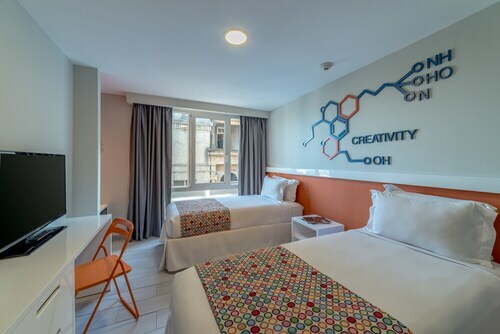 Located in Colonial Zone, this hotel is 0.1 mi (0.1 km) from Calle Las Damas and 1.5 mi (2.4 km) from Embassy of the United States Dominican Republic. Convento de los Dominicos and House of Tostado (La Casa de Tostado) are also within 5 minutes. Located in Colonial Zone, this hotel is 0.1 mi (0.1 km) from Calle Las Damas and 1.5 mi (2.3 km) from Embassy of the United States Dominican Republic. National Pantheon (Pantheon Nacional) and Amber Museum are also within 5 minutes. Santa Maria la Menor Cathedral, a site of spiritual significance, is the perfect place to learn more about the local culture and religion. 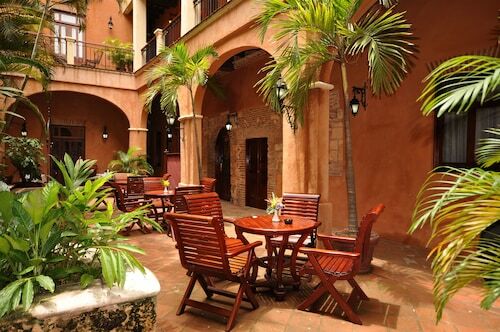 If you've never been to Santo Domingo, the national capital, you now have the perfect excuse! After an eventful afternoon of exploring, you'll be able to enjoy a well-deserved break at one of the many hotels within walking distance. Within 0.6 miles (1.0 kilometer) of Santa Maria la Menor Cathedral, there are no less than 43 possibilities. Why not look into the Hostal Nicolas de Ovando Santo Domingo - MGallery Collection, Hotel Doña Elvira and Boutique Hotel Palacio? If you would sooner spend your money on some fun adventures, instead of on cushy hotels, have a look at the array of budget hotels a short stroll away. A couple of popular examples are the Casa Naemie, 0.09 miles (0.14 kilometers) away, and the Hostal La Colonia, 0.1 miles (0.2 kilometers) away. Following an exciting day of seeing the sights, put your feet up at one of the first-rate hotels close by. 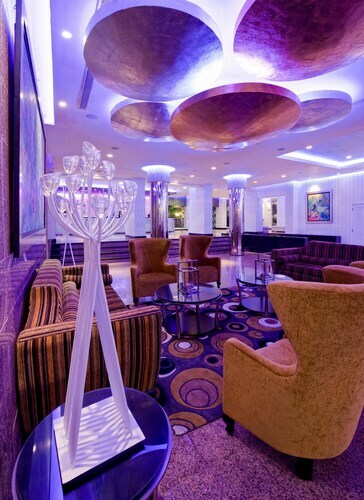 Two decent choices are the Crowne Plaza Santo Domingo, only 1 mile (2 kilometers) away, or the Hotel Frances Santo Domingo - MGallery Collection, 0.2 miles (0.3 kilometers) away. There is nothing as good as wandering around somewhere new to develop your appetite. After visiting Santa Maria la Menor Cathedral, replenish your energy levels a short walk away, at Double´s. If you have time and are still hungry, you can also experience the delicious food at Cafeteria La colonia. As the day winds up, you can celebrate the travel memories yet to come at Casona TMR, only a few more steps away. Broaden your horizons by visiting Cathedral of Santo Domingo. Even though you need to book in advance to get a view of the interior, it can also be admired from afar. Try to comprehend everything you always wanted to know about periods and ages at Larimar Museum, and satisfy your hunger for knowledge. Stroll through Parque Colon, and try to visualize the scenes that played out at this piazza many lifetimes ago. It is worth going to see Iglesia de Santa Clara, a well-known place of prayer as well as a local landmark. Visit the Amber Museum, where you'll probably enjoy some of what's on display and discover something new. How Much is a Hotel Room in Santa Maria la Menor Cathedral? Hotels in Santa Maria la Menor Cathedral start at $49 per night. Prices and availability subject to change. Additional terms may apply.